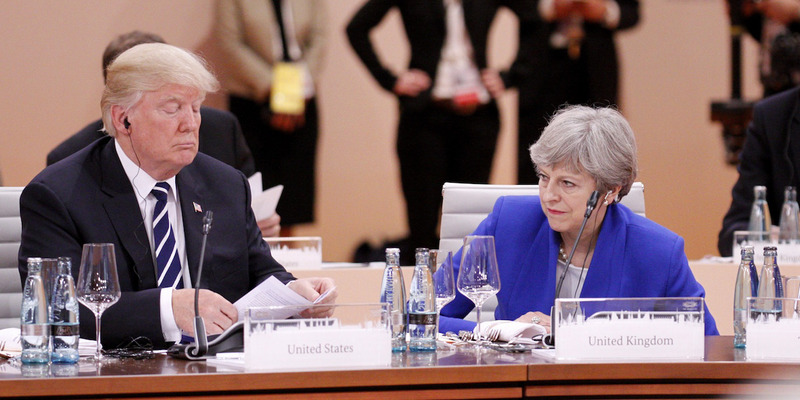 Thorsten Gutschalk / GettyBritish Prime Minister Theresa May and US President Donald Trump at the first session of the G20 summit on July 7, 2017 in Hamburg, Germany. Experts say Trump’s global trade war makes a UK-US Brexit trade deal almost impossible. “[The US] believes the UK needs free trade deals and so is in a weak position. The US is maximising its leverage to exploit that weakness,” said Dr Tom Wright, director of the Center on the United States and Europe. Britain’s ability to forge a trade deal with the US is seen as a crucial test for Brexit, and for the country’s capacity to forge its future as an independent trading powerhouse. 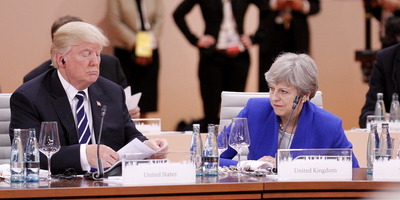 LONDON – The Trump administration will seek to exploit the UK’s weakness after Brexit, making a quick and beneficial trade deal almost impossible for Theresa May to achieve, according to leading US trade and foreign policy experts. “The Trump administration is pursuing a predatory policy towards Brexit,” Dr Tom Wright, director of the Center on the United States and Europe, a Washington-based policy group, told Business Insider. Britain’s ability to forge a trade deal with the US carries huge symbolic importance for Brexiteers, and is seen as a crucial test of its capacity to forge trade deals as an independent country after it leaves the EU. Prime Minister Theresa May has consistently touted the prospect of a swift free trade agreement once Britain leaves the EU in March next year, with a readout from Downing Street in December saying the prime minister and president had repeated their commitment to “a swift post-Brexit bilateral trade deal” during a phone call. But Wright said Trump’s long-held hostility to the concept of free trade, as well as hostile comments made by senior members of his administration, indicate that a trade deal will be extremely difficult, if not impossible. “President Trump has an aversion to free trade. He’s opposed almost every free trade deal the US has signed since World War Two,” he said. Wright also pointed to comments made by US Commerce Secretary Wilbur Ross in November, who said a free trade deal would depend on the UK scrapping “unnecessary regulatory divergences” with the US – meaning Britain would be forced to accept highly contentious imports such as chlorinated chicken, something already ruled out by the UK government. “Ross is saying: ‘Do it our way or take the punishment,'” said Wright. Washington’s position on agricultural products goes to the heart of the Brexit dilemma that May faces. Any decision by Britain to converge with US standards would mean it diverged from EU standards. That, in turn, could wreck the prospect of a free trade agreement with the EU, its largest trading partner – something the UK is unlikely to entertain. Similarly, the UK’s ambition to achieve a tariff-free trading relationship with the EU appears to be incompatible with US demands. Theresa May insists that the UK will no longer be bound by the EU’s Common External Tariff when it leaves, but her pledge to arrange tariff-free access to the EU would mean the UK needed some form of customs partnership with the EU. Despite May’s insistence otherwise, that arrangement would likely rule out a UK-US trade deal, because customs partnerships limit the ability of individual countries to negotiate free trade agreements. “The EU’s price for a free trade deal will be a common customs tariff that affects the UK,” said Hufbauer, who served in the US Treasury Department from 1974 to 1980. He said a common customs tariff would not be “compatible” with a free trade agreement with the United States. Whether Washington’s opening position can be chalked up to negotiating tactics remains to be seen. For his part, Hufbauer suggested that Wilbur Ross’ comments in November were “a way of trying to soften up public opinion in the UK” rather than the bottom line. Despite that, there appears to be little serious belief in Washington that a comprehensive free trade deal can be negotiated in the UK within a couple of years. Hufbauer suggested that the UK could make some progress by “breaking it into parts” and arranging sector-specific deals with the US, but he said that something approaching a full deal would take a decade.